Within the Destiny 2 Curse of Osiris DLC pack, which originally launched back in December 2017, there comes to the new Eater of World Raid Lair. In this Destiny 2 Eater of Worlds guide, we'll be walking you through how to complete the first Raid Lair to hit Bungie's game, including every challenge and boss that you'll be facing. But if you instead need help with anything else related to the latest Destiny 2 expansion, including how to kick of all the brand new content, as well as complete every brand new Strike in the DLC, head over to our Curse of Osiris DLC guides walkthrough hub. As with the Leviathan Raid itself, your entire Fireteam will need to be at least Power level 300 to safely venture into the Eater of Worlds Raid Lair. 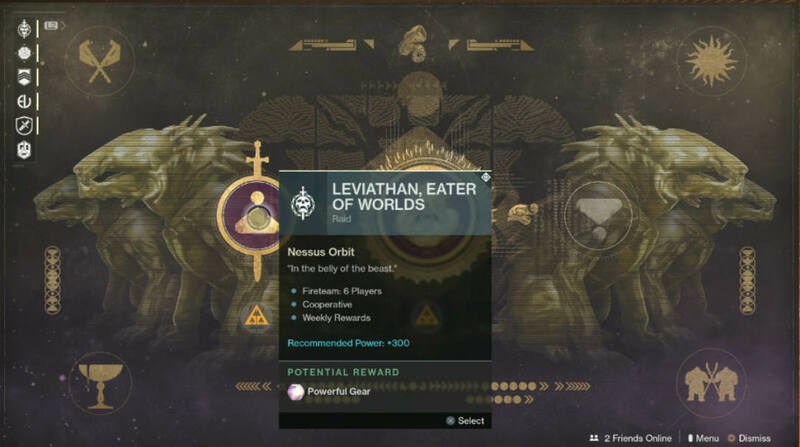 From the Director, select Nessis Orbit, and then select the Eater of Worlds Raid Lair option to the side of the main Leviathan Raid. Your Fireteam will now be placed outside the entrance gate of the Raid Lair, and you'll have to venture forth to take on the first challenge in the series. Read on for our full guide to completing the Eater of Worlds Raid. First off you'll have to progress through a tunnel network to reach the first proper challenge of the Leviathan Raid Lair, and although this sounds complex, it's actually a complete walk in the park. Once you're at the end of the tunnel network, you'll encounter a purple lake of poison, with platforms rising up out of the lake. The catch here is that only one of your Fireteam can be stood on one platform at a time, so you'll have to methodically work your way over the lake, letting one team member go at a time. We should also note that if a single player is stood on any one platform for too long, it'll automatically sink into the poison, meaning you'll have to work your way across the lake fairly quickly. Psion snipers are above you on either side, so make sure to bring a scout rifle with you, and take them out as you move along. After you've reached the first 'checkpoint' area of solid ground above the poison lake, your Fireteam will have to split up, making their way in two groups of three over the poison lake on different sides, and eventually regrouping at the end of the area. 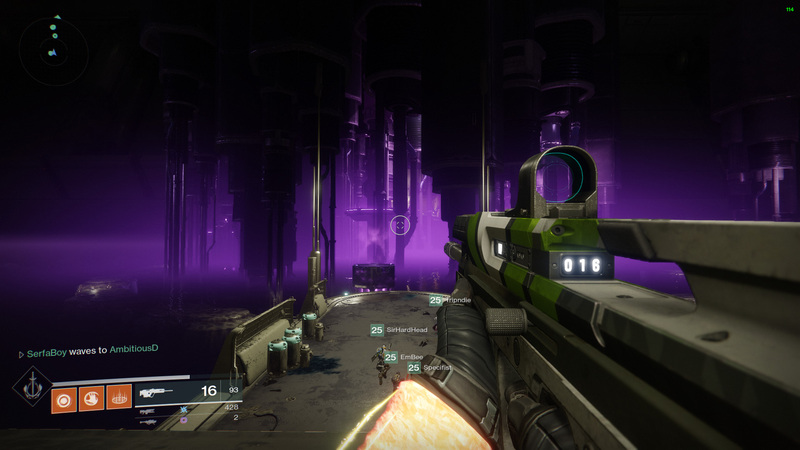 At the very end of the area, you'll have to hold out against a few waves of Cabal enemies, after which a loot chest will spawn, delivering your Fireteam some valuable items. The area directly after the purple lake of poison is dubbed the electrical walkway, and for good reason. As you make your way along the pipe in the center of the area, a flash of light will ocassionally occur, wiping out every player who isn't taking cover behind some form of object. Therefore, your Fireteam needs to huddle behind the barriers to either side of the pipe whenever possible, leaving no one out in the open to get hit by the blast. The section after the electrical walkway is slightly more complex, as your entire Fireteam will be fired out of a cannon and into the dark void of open space. In this section, your Fireteam will have to work their way downwards, towards the gigantic piece of debris in the center of the area, while platforming off of the lesser pieces of debris scattered throughout the area. Bear in mind that the circular Vex portals are there to guide your Fireteam, so make sure to always be working in the general direction of one of them. Once you've reached the bottom of this area in space, things get complicated. At the edges of the arena, you'll notice that there are three elemental signs, one for Arc, one for Solar, and one for Void. You now have to split your Fireteam up, with two players standing near each elemental sign. At this point, Vex Cranium objects will now spawn on floating platforms around the arena, so each team of two needs to grab a Vex Cranium object each, and then return to their original elemental area to 'charge' the Vex Cranium up. Now, once the Vex Cranium pieces are charged up in whichever elemental locations you placed them in, they'll spawn in the area as a form of cannon, charged up with the element of whichever area they were charged up in. Each Fireteam member will now need to pick up a cannon charged with an element, and fire on the large structure in the middle of the area, matching the element of the cannon with the type of elemental crystal that is on the side of the structure. It's not an easy process by any means, and you'll need to keep at it until the structure is eventually defeated. Once you've eventually removed all the outer shell of the massive structure from the previous section with the charged cannons, Argos, Planetary Core boss appear. The same rules of charging the Vex Cranium to form cannons actually remains in this boss fight, and after waiting and shooting at your Fireteam for a while, Argos will spawn a glowing orb just outside of its prism, which you'll have to shoot at with a matching elemental cannon. However, there's a catch to this. 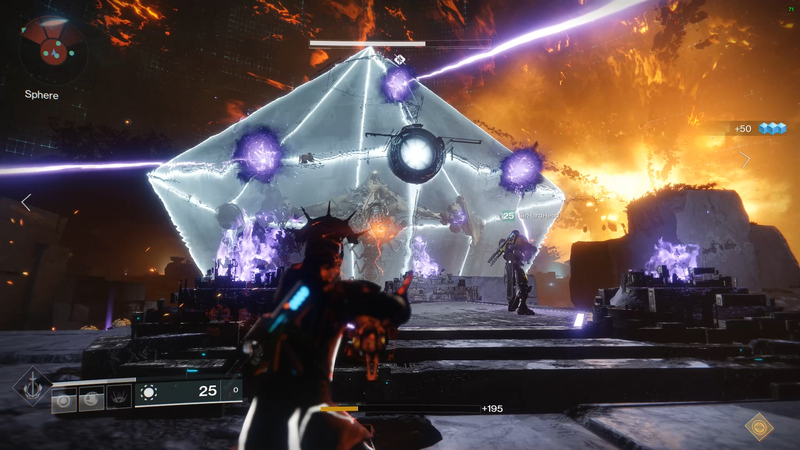 Instead of simply destroying all three orbs at any given time, your Fireteam has to destroy the three elemental orbs at exactly the same time, so they all retreat into the prism around the boss together. 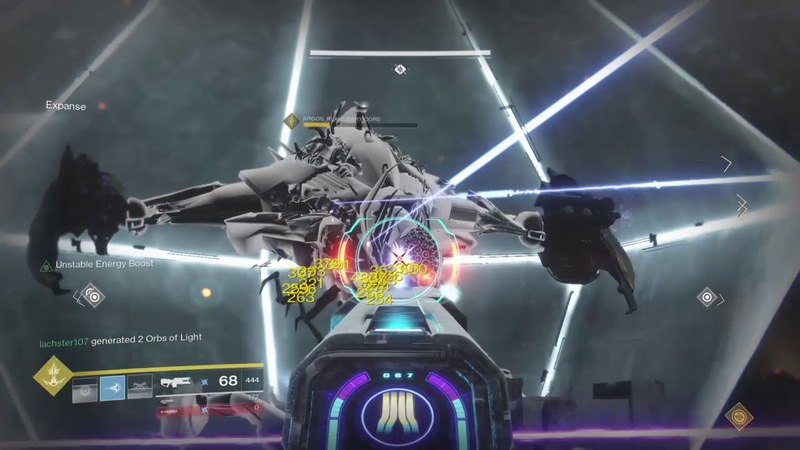 If this is done correctly, the shield around Argos, Planetary Core will drop, allowing your Fireteam to open fire upon the boss. Take care that no one gets caught in the 'net' attack that Argos can unleash, as if it catches a player in its grasp, they'll have to be saved by a member of the Fireteam. After you've unleashed enough damage upon Argos, multiple weak points will open up on his arms, back, and head, and at the same time, a series of new platforms will materialise. These weak points on Argos don't break under heavy damage, but instead break under sustained damage, which means we'd recommend splitting your Fireteam up into groups, and have them focus fire on particular weak points with fast firing weapons like auto rifles or trace rifles like Coldheart of Prometheus Lens. After you've broken a pair of weak points on Argos, the prism shield around the boss will reform, meaning you'll have to redo the entire process with the charged elemental cannons to take down the shield once again. The special ability that Argos has, that can completely wipe out your entire Fireteam in one go, is basically on a timer, meaning you'll have to beat Argos in no more than four takedowns of his special prism shield. 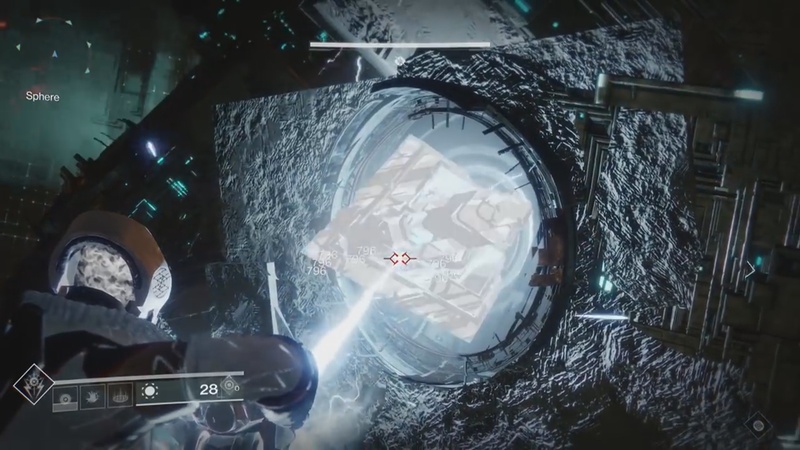 Should you accomplish this however, the Leviathan Eater of Worlds Raid Lair will be complete, and the treasures are yours to recover. This brings our Destiny 2 Eater of Worlds Raid Lair guide to a close, but we have a number of additional Curse of Osiris DLC guides here at USgamer, including how to complete the Tree of Probabilities Strike, as well as how to obtain Sagira's Exoic Ghost Shell.